The former Auburn star met Miller while preparing for the NFL draft. When his name wasn’t called, he quickly signed with Denver so he could learn from the best — with lessons thrown in from two other first-rounders, rookie Bradley Chubb and Shane Ray, along with Shaq Barrett and pass rush consultant DeMarcus Ware. “Being around those guys, it’s like stealing,” Holland said Friday after he was promoted from the practice squad with Barrett (hip flexor) out for two to four weeks. In Holland’s case, his next play will be his first. 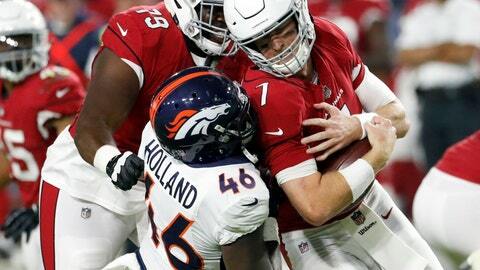 Holland said he’s eager to join the likes of Lindsay, Chris Harris Jr., Todd Davis and Case Keenum, all of whom have made a name for themselves after going undrafted. Nose tackle Domata Peko faced his former team, the Bengals, in Denver last year and this weekend he’s going back to the city where he spent his first 11 NFL seasons. “It means the world to me to go back and I’ve definitely got to play well,” Peko said. “Being somewhere for 11 seasons, over a decade, and to go back for the first time — I know last year they came up here, but it’s going to be different being on the opposite sideline. Among the Broncos donning colorful cleats for the league’s “My Cause, My Cleats” initiative in December is second-year receiver-returner River Cracraft, who’s honoring his friend and Washington State teammate Tyler Hilinski , who killed himself in January. “It was kind of like a first instinct,” said Cracraft, whose red-orange and blue cleats promote Hilinski’s Hope, the foundation Tyler’s family created in his memory to support programs destigmatizing mental illness.